I have to admit that I do have at least one fault and that is that I hate waiting. I have a number of packages flying somewhere around the world on the way to me and I have no clue when they are going to arrive! Issue 173 of World of Cross Stitch ordered on back order because I missed it in the shops. A Evenweave grab bag from Polstitches. It looked kinda cool so I got myself one of them to try. All of these wonderful items have been paid for and I am waiting ... waiting ... waiting for one of them to turn up. It really is a toss up which will arrive first since the first 2 were ordered a couple of weeks ago but they are coming from Europe while the other 2 were ordered last week but they're coming from America. America tends to ship faster but Europe is cheaper.... odd how that works. Now I do also have a stitching update. 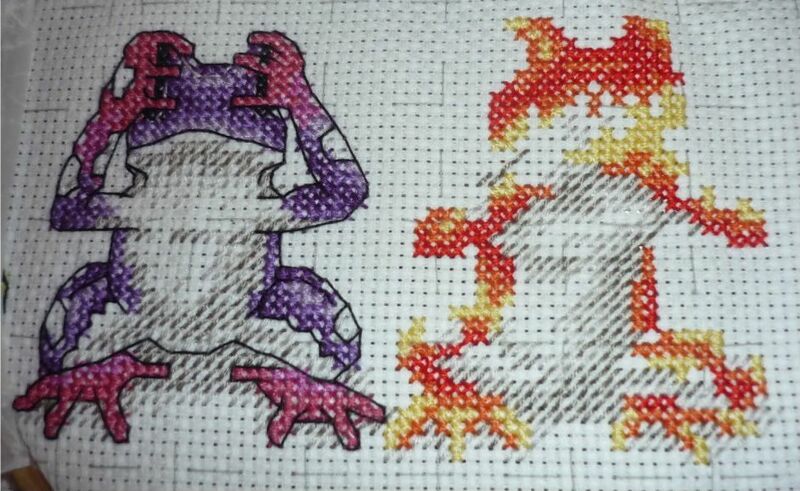 My last frog is one colour away from being ready to back stitch and then I am done! It just needs some black around the eyes and then I am ready to start back stitching. It may even get done tonight after I finish teaching depending how tired I am once I get there. I do enjoy watching the frog appear from the stitching but I have had to unpick quite a lot of this one because I wasn't counting very well or looking at my tacking enough! Hopefully there will be a finish to show tomorrow and some time this week I will put my entry form in for the EKKA (royal Brisbane exhibition) which means I will definitely have to finish my Land In Sight by mid June so I can get it framed. Exciting Stuff. your frogs are so cute!